It makes me so happy to share my latest creation with you—perhaps you can come to the party? The Stumpers is my new children’s picture-book about togetherness and the joy of working toward one’s dreams. It follows the life of a cozy family of gnome-like people and all the good things they enjoy as they live in harmony with their world. The the tale grew organically out of making the dolls and their forest home in my studio. Here’s a link to a video that tells more of how they came to be. Music is an important part of my life, and it’s part of the Stumpers’ world too, so it was such a treat to include an original song in the e-book version of The Stumpers. “The Stumpers’ Frolic” is played by the talented Laura Cortese, who also narrates the e-book. As an added treat, Laura will be at the launch party, where she and I will chat about creativity, making art, and working together on this project. The Stumpers is my sixth book with Dromedary Press, a publishing company I started with the goal of making beautiful books exactly the way I envisioned them. No one, whether they’re an independent or one of the big houses, knows what the future holds for book publishing, but one thing that’s clear to me is that great things are possible when we work together. If you enjoy The Stumpers, my wish is that you’ll spread the word by sharing it with your friends, both in person and online. Gnomevember starts a grand season of merrymaking. 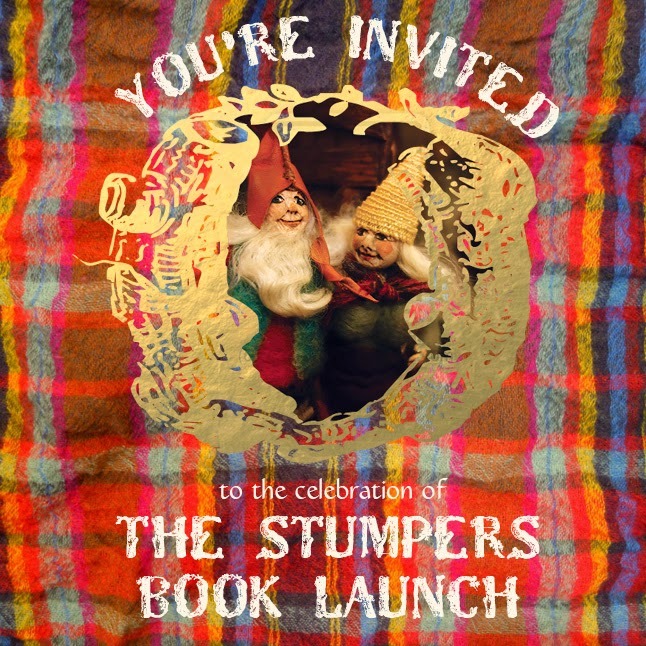 I hope you’ll join me to celebrate The Stumpers and its themes of togetherness, joy, song, and dreams made real. Bring a friend! A special a free gift with purchase of The Stumpers at the event! Whether or not you can make it to the party, I invite you to visit TheStumpers.com, where you can not only order the book and some magical moving postcards, but also send your friends an email greeting straight from the Stumpers themselves!